Leopard Gecko Diet & Food: What Do Leopard Geckos Eat? Leopard Gecko Diet & Food Guide: What Do Leopard Geckos Eat? A proper diet is probably the main secret to keeping your pet leopard gecko happy and healthy. Find out what is a balanced leopard gecko diet in our guide! That some species of lizards consume fruit and vegetables as well. But leopard geckos are special. How is that? Feeding problems could be a sign of specific health or environmental issues. Proper diet is probably the main secret to keeping your pet leopard gecko happy and healthy. And surely, a balanced approach to nutrition has helped my pet leos thrive. Let’s look at some leopard gecko diet advice that I summed up from the best resources on the topic available and, of course, my own experience. What Do Leopard Geckos Eat in the Wild? Leopard geckos are insectivorous lizards. In the wild, they primarily hunt invertebrates. While their full menu is unknown, based on their habitat’s biodiversity and some observations, we can estimate that they consume grasshoppers, crickets, spiders, beetles, caterpillars, flies, and even small scorpions. Leopard geckos also opportunistically feed on smaller lizards, snakes and newborn rodents if they happen to stumble upon their nests. Unlike some other common pet lizards, leopard geckos will eat live insects only. They won’t accept canned or dried reptile food or meat. There are exceptions to this rule, but they are very uncommon. Feeder insects are bred in captivity to feed pet reptiles and some birds. Some of these feeders will be your gecko’s primary diet. There are many species of feeder insects available on the market, and the list is increasing. Let’s look into the most common leopard gecko feeder insects. Mealworms are probably the most popular and most widely sold live food for lizards and other pets as well. They are easy to keep and breed, and geckos accept them readily. There has been a lot of debate about using mealworms as a primary food because of their relatively high-fat content, and their poor phosphorus-to-calcium ratio. However, one of the greatest authorities on captive-bred leos – Ron Temper, state that mealworms make a perfectly good staple food for leopard geckos. My own experience has been in line with that. As mealworms are the easiest feeder to raise at home, you should keep a colony so that you can have a sustainable food resource at all times, regardless of outer circumstances. Never give your leos mealworm beetles, as their shells are tough to digest and may cause impaction. Crickets are another readily available feeder insects. They take more space to keep than mealworms, are usually noisy and keen on escaping, if you take the right steps, they are still easy to maintain and breed. The specific reason why they are so popular with leopard geckos is that, unlike larvae and roach feeders that tend to burrow and hide, their escape instinct also triggers leo’s natural hunting behavior. Also, crickets have a good protein ratio and are relatively low and fat, but you should always serve them dusted with vitamin powder. Different species of tropical roaches (not the kind from your bathroom) make very suitable feeders. Dubia roaches are easy to breed and are lasting if you provide the right temperature and appropriate hiding places. Plus, they have excellent nutritional value. Unlike some other commercially-bred roaches such as Turkestan cockroach, Dubia roaches are slow and can’t climb walls, so escape risk is low, and handling is a breeze. Because of their fat content, waxworms are something like gecko junk food, and naturally – leos love them. Give them only as an occasional treat, or as a “bribe” to help a recently moved gecko who lost his appetite. There are more attractive feeders available from breeders, such as silkworms, hornworms, various other roaches, etc. Black soldier fly larvae are especially attractive because of their near-perfect calcium to phosphorus ratio. 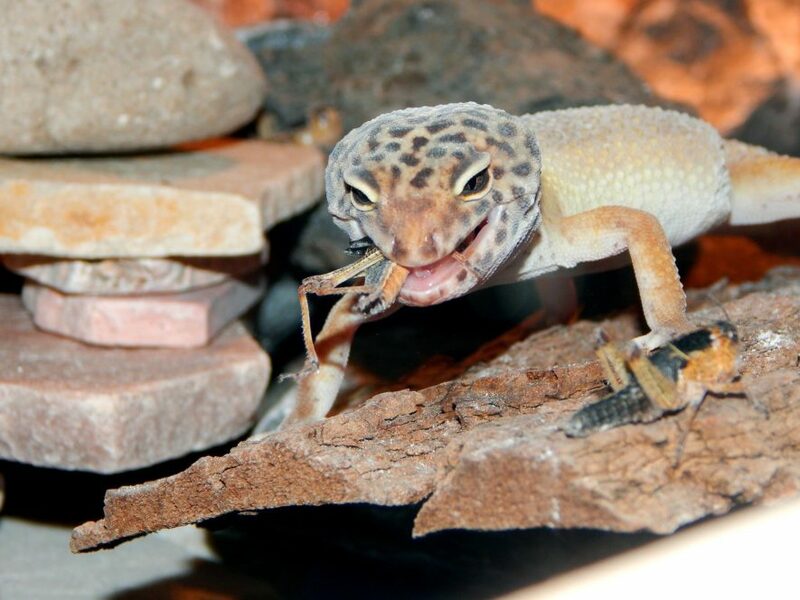 Wild insects are a good way to add variety and more nutrients to your leopard gecko diet. On the other hand, be aware of the risk of introducing parasites and disease is higher than with regular feeders. Every gecko enthusiast should decide for himself if the benefit is worth the risk. Personally, I’ve had a good experience with small grasshoppers and crickets caught at our vacation property. When collecting wild insects, please make sure the area has not been sprayed with pesticides, that there are no significant polluters such as busy roads, power plants or factories nearby, and that you’re not jeopardizing any nature protection efforts. Additionally, stay away from spiders and caterpillars. Spiders can give your pets a nasty bite, and many caterpillars have chemical defense mechanisms which can harm your geckos. Do Leopard Geckos Eat Fruit? Unlike bearded dragons and green iguanas, leopard geckos do not eat fruit and vegetables. They are purely carnivorous lizards. Save your vitamin-rich fruits and veggies for gut-loading the feeder insects. Should I Give My Gecko a Pinkie Mouse? Some breeders will advise you to feed your gecko an occasional newborn rodent – the so-called pinkie. However, rodents are too fatty to be leopard gecko’s regular food item. However, there are specific cases when you can add pinkies to your leo’s menu. If you have a breeding female, you can give her one pinkie a week. Also, pinkies have been known to help young geckos to meet their nutritional needs during growth sprouts. If you are feeling uncomfortable with the idea of giving live baby rodents to your geckos – they will do just fine without it if you provide quality, supplemented insect feeders. Unfortunately, no home diet can replace the variety that lizards enjoy in their natural habitats. That is why the feeder insects should be dusted with special reptile vitamin and mineral supplements in the form of powders, and why they should be gut-loaded before giving them to your pet. As for powdered supplements, go with the multi-vitamin carnivorous reptile powder from a reputable producer. Make sure that the mix includes the vitamin D3 – leopard geckos are a twilight/nocturnal species. Because they don’t bask in the sun or under a UVA/UVB light, it is crucial to provide Vitamin D3 through their diet. You should lightly dust the insects before every feeding. Since my geckos are quite old, I occasionally skip dusting to avoid burdening their livers. Leopard geckos have high calcium requirements which sometimes cannot be satisfied only through dusting – this especially goes for juveniles and breeding females. Therefore, you can leave a small tray with pure calcium supplement in the tank. Leo with a calcium craving will find it and lick it. Make sure to use plain calcium for this purpose, and not the one enriched with vitamin D3 to avoid overdose. Another vital way to boost vitamin in mineral content in your gecko’s diet is to gut-load your feeders. Gut loading essentially means feeding the insects with premium, nutrient-dense foods 24-48 hours before giving them to your pet. Note that loading doesn’t exclude using supplements, and vice-versa. Here is some general advice on feeding your leopard geckos the right way. No matter what type of insects you will choose as your leo’s staple food, always aim for variety. Try to incorporate as many different species of feeders as practical. An adult gecko can eat as much as 10 insects per feeding. While there is general advice that you should let your leo eat as much as he wants per feeding, an experienced breeder told me that the optimum number is 4-6 mealworm-sized insects. The amount of food depends on your plans for breeding your geckos – breeding animals need more food and larger reserves, especially the females. Adult geckos can be fed 3-4 times a week – every other day on average, with a possible two-day fasting period. Hatchlings and juveniles should be fed every day since they grow very fast. Provide a feeding tray in your tank, shallow enough to provide easy access, and deep and smooth enough so feeder worms can’t escape. Crickets and flying insects will inevitably move around the terrarium, and geckos will hunt them as they would in the wild. Though leos can take on bigger insects, the size of your gecko’s prey shouldn’t be bigger than the space between his eyes – to ensure normal digestion and to avoid bowel impaction. Never leave robust and biting prey insects such as large crickets, locusts or superworms in the tank, as they can hurt your geckos when they are resting. Instead of just leaving food in the tank, you can feed your gecko by using reptile feeding tweezers or tongs. That way you can precisely control how much your gecko eats, which is useful if you house two or more in one tank. The downside is that feeding your geckos out of hand reduces their hunting instinct – instead of looking around for prey, they’ll be watching through the glass at your hands all the time! Leos store excess fat in their tails, so by observing the tail, you’ll be able to tell if your leo is eating too little or too much. The tail of a healthy and fit gecko should never be lean. On the other hand, in my opinion, it shouldn’t be at its maximum either, except in the case of breeding females. Leopard geckos can get obese. If you suspect your leo is overweight, watch out for the signs: armpit bubbles, too fat tails, and stubby, sausage-like legs. Why Is My Leopard Gecko Not Eating? Reasons for your leo’s lack of appetite can be numerous, and usually are health-related. Sick animals typically do not eat, and the lack of taste for food is one of the most common symptoms of various conditions, which deserve an article of its own. However, before you start panicking, let’s look at several common reasons why a healthy leopard gecko may decline food. Reptiles won’t eat when their environment is too cold. As ectotherms, they are not able to digest food properly if their body temperature is not right. Always ensure that the temperature in your tank is within the right limits. I am talking about it in the leopard gecko habitat article. When checking temperature, it is best to measure it near the floor of the tank, since this is where your leo’s belly lies. Leopard geckos are territorial, which also means they are quite sensitive about their living space. Moving them is stressful and can result in food refusal. Try to get their appetite up with crickets whose movements will trigger a hunting response, or the fatty waxworms which are often irresistible to leos. If your gecko refuses to eat for a week or more, you might have to resort to assisted feeding to re-activate your pet’s feeding response. Larger feeders, especially superworms and crickets, can and will bite to defend themselves. That can be a traumatic experience for your leopard gecko, which may cause the poor lizard to avoid some foods. Always give your gecko the right size of prey. You can also crush heads of larger superworms with feeding tweezers immediately before feeding. A gecko that is bullied by others might refuse to eat. Never overcrowd your terrarium, and be careful if you keep a pair. Keeping a male with just one female might result in her getting bullied. If that is the case, the best solution is to house them separately or get more females if the tank space allows it. Leo breeding season takes place between January and July. During this period females ovulate, and some might stop feeding for a while. If your female gecko is well nourished, there is nothing to worry about, as she will be able to handle some fasting. How Do Leopard Geckos Drink Water? Though they still get most of the needed moisture from food, leopard geckos will often drink water directly, so having a water tray in your tank is essential. They use their tongue to sip water, much like dogs or cats do, which makes their drinking behavior quite interesting to observe. You should change the water in daily. For adults, the tray should be reasonably shallow – no more than half an inch (~1 – 1.5 cm) deep. Be careful if you keep juvenile leos – baby lizards easily drown in water, even the type of tray that would do alright for bigger lizards. The dish for hatchlings and small juveniles should be less than 1 centimeter deep. Proper diet and nutrition, in tune with the species’ natural and evolutionary needs, is essential for having happy and healthy pets. The same is true for leopard geckos. Fortunately, a quality diet for leos is not hard to provide. Give live insects, aim for variety, add supplements, always have water in the tank and you should be fine. Watch out for feeding issues as a sign of possible health or environmental problems. Hopefully, this article provided you with inspiring insight into leopard gecko diet. How do you feed your leos? How varied is their diet? Do you grow your feeder insects personally, or buy them from suppliers? Let us know in the comments! We’d love to hear from you! Ectotherms – animals whose body temperature depends on external temperature. Feeder insects – insects that are bred and sold primarily to feed pet animals such as reptiles or certain birds. Mealworms – Larvae of mealworm beetle (Tenebrio molitor), a species of darkling beetle. Pinkies – newborn mice, rats or other commonly bred rodents sold by rodent breeders as small snakes and larger lizards feeders; the name is due to their hairless skin coloration. Superworms – Larvae of Zophobas morio, another species of darkling beetle. Waxworms – Caterpillars of greater or lesser wax moth.